This is such a simple cream cheese to make, and the benefit of making it yourself is you can add whatever flavourings you like the most. I tend to make a large batch and split into three. One pot I keep plain, a second I add garlic and herbs to, and a third some dried chilli – if you haven’t tried chilli cream cheese you really should give it a go! Spicy yet cooling all in one delicious mouthful. 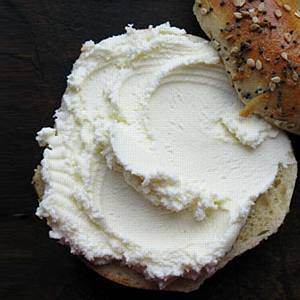 Making cream cheese does take a little time, but is worth the results. Flavourings – anything you fancy! If refrigerated allow the milk and cream to come to room temperature. Do not use UHT milk or cream – pasteurised or raw are both fine though. Add the milk and cream to a large pan or jar then stir in both the starter culture and liquid rennet. Do this slowly and it often helps to let the starter culture rest on the top of the milk and cream mix for a few minutes before stirring to avoid lumps. Cover the pan or jar and wrap in a tea towel. Pop it in a warm place – around 70f (21c) – and leave for 12-24 hours. The warmer the room the faster the cheese will culture. Once there is a layer of whey and the curd mass pulls away from the side of your pan it is ready for the next stage. Put the curd into a cheesecloth, tied over a bowl, allowing the whey to fully drain off. It should take 8-12hrs or so to fully drain. Give the curd a little mix every few hours to aid draining. The longer you drain the firmer the cream cheese, so you will have to judge how firm you prefer it at this stage. As you can see it is all very simple! Very few ingredients, simple equipment, and no excuse for the additive and preservative laden shop bought offerings that will never match the flavour of home made. This cream cheese will keep in the fridge for 5-7 days and can also be frozen.